Simply Rins supports Earth Hour. Do you? Every year, World Wildlife Fund (WWF) encourages everyone to participate in a global and annual event called Earth Hour. Every last Saturday of March, WWF is asking us to switch of unnecessary lights and appliances for one (1) hour. The objective is to promote awareness on the rising climate change and that we have a responsibility to do something about it. With all the recent natural disasters happening around the world, to be indifferent is to be heartless. We all need to take care of Mother Earth. I made an Earth Hour nail design as my personal way of support for WWF's Earth Hour and hopefully it this nail art can help in spreading the word about this worthy event. 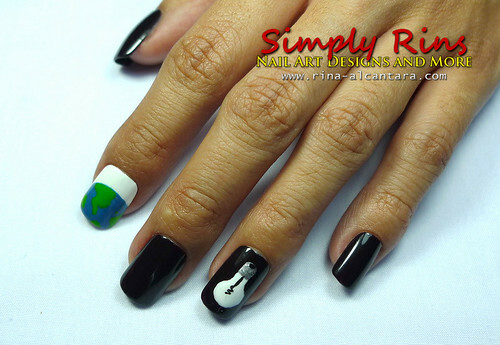 Earth Hour nail art design by Simply Rins! I have 3 accent nails on this Earth Hour nail art -- on my 2 pointer finger and on my right hand's ring finger. I painted the earth, the number 60 that represents the no. of minutes in an hour, and a light bulb to signify that we are encouraged to turn off our lights on the 26th of March 2011 from 8:30 to 9:30pm in support of Earth Hour. I used 2 coats of OPI Lincoln Park After Dark on all my nails except for my pointer fingers wherein I used 2 coats of OPI Alpine Snow. I used nail polish for painting every image. For the earth and no. 60, that's OPI Suzi Says Feng Shui for the blue color and Faceshop GR502 for the green color. For the light bulb, that's OPI Alpine Snow and Revlon Silver Screen. For 2011, WWF is asking us to go beyond an hour. After turning your lights back on after an hour, WWF is encouraging us to think of other acts we can contribute to take care of Mother Earth. In my small way, I'm using energy saving light bulbs in my shop, I unplug appliances or electronics when not in use, I use eco bags instead of plastics when going to the grocery or shopping, I use high octane gasoline on our car to burn fuel efficiently, my family uses 100% biodegradable laundry detergent, and more! How about you? Please visit the Earth Hour Website for more details and to find your local Earth Hour sit. There are fun stuffs included in the site, like making your own virtual lantern and sharing your act to go beyond the hour. Again, Earth Hour will happen on Saturday, March 26, 2011. Please switch off lights for an hour from 8:30pm to 9:30pm. Go beyond an hour this year by pushing yourself to be responsible and take part in promoting energy conservation. 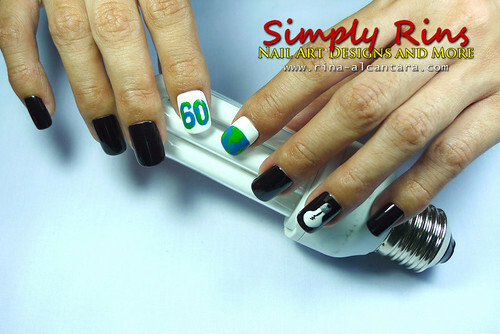 I hope this Earth Hour nail art can be an inspiration to everyone. To Ali, thanks so much. It feels nice to be able to do nail art and at the same time promote something worthwhile or share an interesting story.